Defeating Hubble, from the ground! By esiegel on February 1, 2012. There's no doubt that the Hubble Space Telescope has given us some of the most spectacular, high resolution views of the Universe. From the most distant galaxies ever seen to stars here in our own galactic backyard, the Hubble Space Telescope has simply dwarfed anything we've been able to do from Earth's surface. This is the globular cluster NGC 288, separated by just over 1 degree from the famed Sculptor Galaxy, as seen through a simple 3" telescope. Larger telescopes can, of course, do better, but from high above the Earth's atmosphere, Hubble's 2.4 meter primary mirror has given us this view of this remarkable object. Image credit: ESA/Hubble & NASA. Absolutely amazing! For over 20 years, Hubble has been returning images like this, with a resolution of just a couple of hundred-thousandths of a degree! The reason it can do this, of course, isn't its size. At 2.4 meters, Hubble is pretty large, but we have plenty of 8-meter and 10-meter telescopes here on Earth, which could get much better resolution than Hubble if they were in space. No, Hubble's advantage is its location. Image credit: NASA, retrieved from the Urban Astronomer. While ground-based telescopes have the entire atmosphere to contend with, complete with turbulent air, a slew of different, moving layers, and intervening molecules, Hubble is literally above all that. Despite their extra size, ground based telescopes haven't been able to compete because of the atmosphere. But a new technology -- adaptive optics -- is changing all of that. Here's how it works. Image credit: Gemini Observatories, NSF / AURA, CONICYT. You start by shooting a powerful laser with very well-defined frequencies, like this sodium laser, creating a guide star that's in the direction you're taking your observational data. You're seeing light from all of the actual stars, galaxies, etc. -- you know, the real observing targets -- as well as your artificial guide star. The beauty of using a sodium laser is that, around 100 km up, there's a thin layer of sodium in Earth's atmosphere that will absorb and re-emit the light back towards your telescope. All the light that comes in, both from your real targets and from your guide star, gets distorted by the atmosphere. But, since you know what your guide star is supposed to look like, you can take the blurred, incoming signal from the guide star, and compute what type of weird, fun house-style mirror you'd need to un-blur the image! Image credit: retrieved from Isa Garcia's blog. Just like a fun house mirror distorts normal images, the right fun house mirror can fix distorted images, if you create just the right mirror. But if you can create the proper mirror to fix the guide star (i.e., the light from the laser), you can also fix the light from your observing targets! Creating a system that continuously adapts its mirror to the changing atmosphere, giving you an undistorted image of your observing target at the end, is the end-all goal of adaptive optics. Video credit: 3 minute visualization of an AO system, by Gemini Observatory. And when this is put into practice, adaptive optics is capable of taking what looks like turbulent, nonsense noise and turning it into a crystal-clear, real-time image of what actually lies out there in the Universe. Want to see it in action? Take a look at this 2006 video of adaptive optics taking on a binary star system; you seriously won't believe it. Movie Credit: Guido Brusa, CAAO, Steward Observatory. Just a couple of months ago, Gemini South Observatory released their first light image from GeMS/GSAOI, the world's most advanced adaptive optics system, attached to the 8-meter Gemini Telescope. And wouldn't you know which object they happened to take a look at for their very first image? Image credit: Gemini Observatory / NSF / AURA / CONICYT / GeMS/GSAOI. We couldn't believe our eyes! 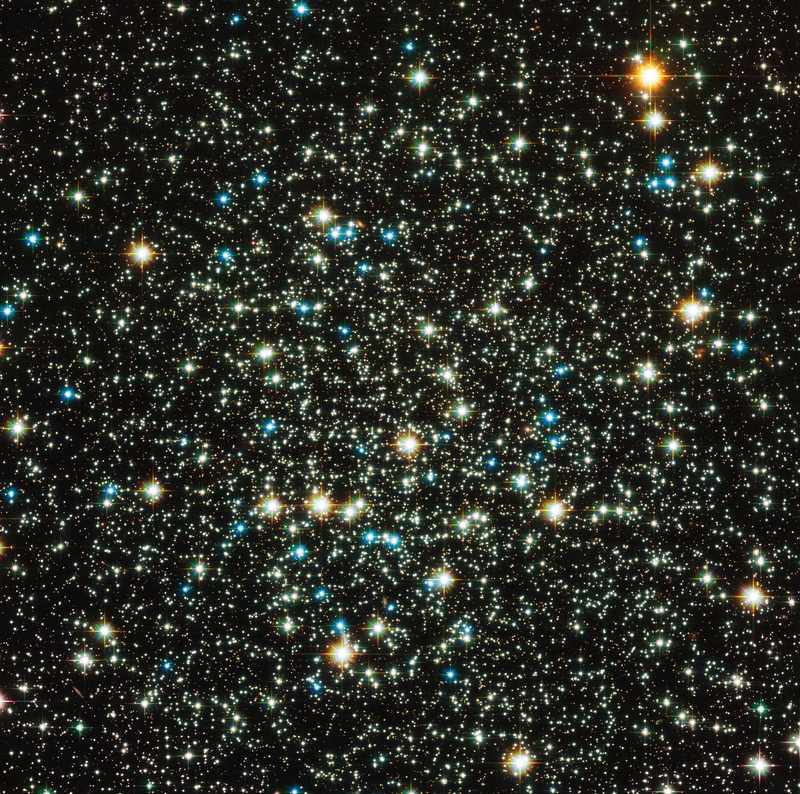 The image of NGC 288 revealed thousands of pinpoint stars. Its resolution is Hubble-quality - and from the ground this is phenomenal. This is somewhat uncharted territory: no one has ever made images so large with such a high angular resolution. And it is! If you horizontally flip and (slightly) rotate the raw image, you can actually overlay it atop the Hubble image back at the top of the page, and compare these two directly! At this zoomed-out resolution, it doesn't look all that impressive, especially considering the monochrome nature of the ground-based image. But let's take a look at a very small region -- those four bright horizontal stars towards the center of the above image -- with both the Hubble Space Telescope and the Gemini telescope with the new adaptive optics! 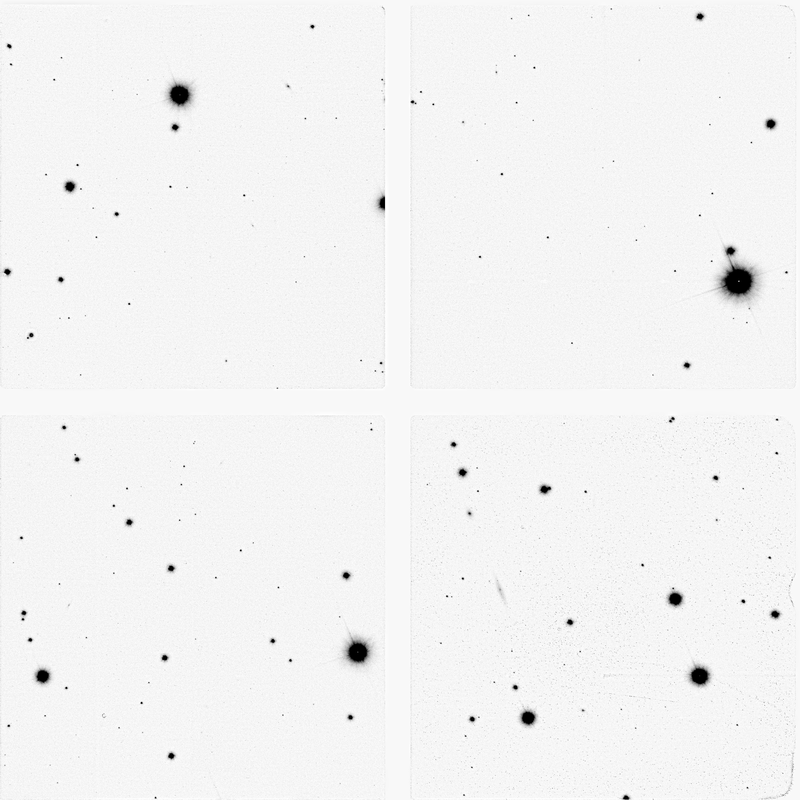 Even at first light -- with its very first image -- the GeMS/GSAOI adaptive optics were easily just as good as Hubble's resolution, the first time that a ground-based telescope has ever done that! Of course, that was like, two months ago already, so Gemini has since gone on to take even higher resolution images than Hubble can, like this one of NGC 2362. Image credit: Gemini Observatory / GeMS/GSAOI. Sorry that there's no Hubble image of this to compare with, only a Spitzer image that really looks like a joke, particularly next to the full-resolution Gemini version. When you're looking at the image above, remember that each quadrant is less than one ten-thousandth of a square degree! Highest. Resolution. Image. Ever. And that's how you defeat Hubble without ever leaving the ground! Could the same be applied to Hubble, forth and back from the heliosphere, to reduce space turbulences? Wow, that's amazing!! It took us 20 years to reproduce Hubble quality on the ground... how many will it take to reproduce JWST's?? Yes, when I first heard, I thought they would try and deform a 8-20 meter primary mirror, but it's obviously easier to deform a small tertiary one. Couldn't this all be done digitally instead of deforming a physical mirror, or is this the tradeoff of either deforming the primary for best results, or digital enhancement for so-so results? And how fast does it have to be? Didn't see the video with sound, maybe they said. Guess this also means it will be harder to get funding for space based telescopes in the future. Is this wavelength dependent? Couldn't this all be done digitally instead of deforming a physical mirror, or is this the tradeoff of either deforming the primary for best results, or digital enhancement for so-so results? With any imaging instrument, you want to make the point spread function as compact as achievable. It's possible to deconvolve the PSF later if you know what it is, but at this level of precision you are dealing with something that might be time-variable, and since convolution is an integral operation the deconvolution may not be unique. Deforming a physical mirror means less uncertainty in the PSF that you later have to deconvolve--if you can reduce its width to a single pixel, then the deconvolution becomes trivial. Joffemannen: some wavelengths are absorbed by the atmosphere, not just deflected around a bit, like high-energy x and gamma rays, so you'd still need to go to space if you want to measure those. Can you retrofit old telescopes with adaptive optic mirrors?? and voila or not?? Very impressive capability, but I think it's only a transitional technology going from taking long term exposures, now improved with adaptive optics, to taking movies and digitally taking out the distortions based on the guide star image analysis of individual frames. That would also allow a rapid retrofit of existing systems. @Joffemannen: Also, a lot of the far-infrared is absorbed by the atmosphere. This happens to be where a lot of interesting astronomy is occurring as we look for more and more redshifted objects. Space telescopes are going to have a place in our arsenal for a long, long time. But it's simply amazing that we can duplicate the power of Hubble on the ground. This means a lot more observatories of that caliber, which is just awesome. The sensors accumulate data over time in order to pick up faint signals. If the image is jumping around, then a faint target is spread over a set of pixels and there is simply no way to post process it to fix it. If you can hold the points steady so that a faint target is spread over fewer pixels, then you can actually get a brighter, as well as sharper, image. You may be able to see the bright guide star in the uncorrected video, but not necessarily the faint target. And yes, you can get adaptive optics kits for backyard telescopes. I've seen one unit that works for refractors by distorting the image with a slanted piece of glass that is moved by an actuator. Geek heaven. Clearly, it's time for 10-meter space telescope. what did you have to put that women`s buttocks in the story for? is this your joke about something in your personal life that I really don`t care about. Uh, mark, that's just another video YouTube decided to promote; it had nothing to do with the original video. Why the need for an artificial guide star and not just a actual star. We know what those are supposed to look like too. Is it a matter of brightness? Of the need for a monochromatic source? I'd like to know more about the mechanics of a mirror that can bend into any shape required. It's hard for me to imagine. Wouldn't it have to bend and ripple into any shape. Its hard to imagine something solid like a mirror bending in such a way that quickly. Are they made up of thousands of pieces of mirror or just a few pieces that can only bend in certain ways? I'd like to know more about the mechanics of a mirror that can bend into any shape required. It's hard for me to imagine. Its hard to imagine something solid like a mirror bending in such a way that quickly. Are they ade up of thousands of pieces of mirror or just a few pieces that can only bend in certain ways? Fascinating, indeed. I once had a vague idea for photography that I haven't really pursued enough to know whether it's feasible or not. Rather than having expensive lenses to focus light from far away, I thought that it might be possible to just let the image be blurry, and then correct for the blurriness using computer graphics. This seems like a serious attempt to do that. "saying it's a new technology is hardly appropriate"
Uhh, it's not like the technology hasn't changed over the last 6 years. And the technology is getting to the point, where just recently they were able to produce images with resolutions matching (and beating) Hubble's, but from the ground. How is that not 'new'? "Take a look at this 2006 video"
"Just a couple of months ago, Gemini South Observatory released their first light image from GeMS/GSAOI, the world's most advanced adaptive optics system"
"Of course, that was like, two months ago already, so Gemini has since gone on to take even higher resolution images than Hubble can"
Another advantage of space telescopes over ground based scopes is lower background. On the ground, there is inevitably background light from the upper atmosphere (airglow).